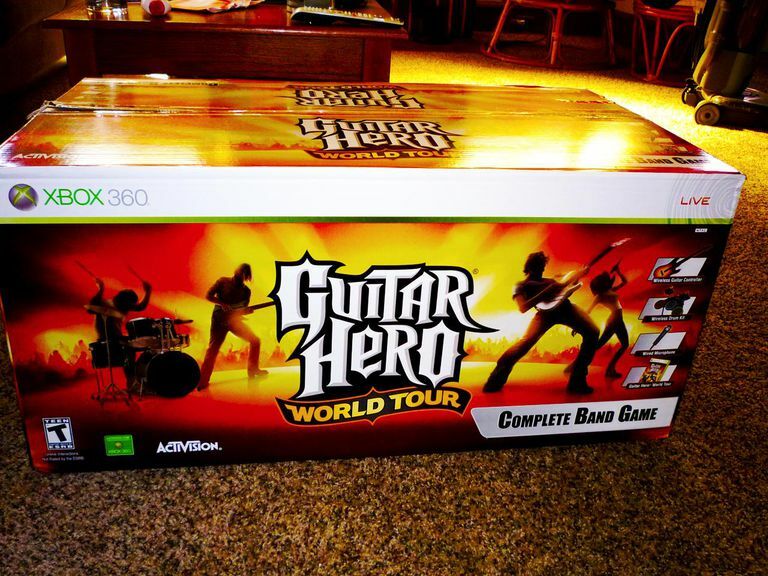 Guitar Hero World Tour is the fourth main addition to the music rhythm video game series and is the first to feature microphone and drum controllers in addition to the guitar-shaped controller. The following cheat codes are available for Guitar Hero World Tour on the Xbox 360 video game system. To enter a cheat code, select the Options menu, then select Cheats and click Enter New Cheat. Next, enter one of the following cheat codes. Unlock Aaron Steele: Blue, Red, Yellow, Yellow, Yellow, Yellow, Yellow, Green. Air Instruments: Red, Red, Blue, Yellow, Green, Green, Green, Yellow. Always Slide: Green, Green, Red, Red, Yellow, Red, Yellow, Blue. AT&T BallPark: Yellow, Green, Red, Red, Green, Blue, Red, Yellow. Auto Kick: Yellow, Green, Red, Blue, Blue, Blue, Blue, Red. Extra Line 6 Tones: Green, Red, Yellow, Blue, Red, Yellow, Blue, Green. Flame Color: Green, Red, Green, Blue, Red, Red, Yellow, Blue. Gem Color: Blue, Red, Red, Green, Red, Green, Red, Yellow. HyperSpeed, HyperGuitar, HyperBass, and HyperDrums: Green, Blue, Red, Yellow, Yellow, Red, Green, Green. Invisible Rocker: Green, Red, Yellow, Yellow, Yellow, Blue, Blue, Green. Unlock Jonny Viper: Blue, Red, Blue, Blue, Yellow, Yellow, Yellow, Green. Unlock Nick: Green, Red, Blue, Green, Red, Blue, Blue, Green. Performance Mode: Yellow, Yellow, Blue, Red, Blue, Green, Red, Red. Quickplay Songs: Blue, Blue, Red, Green, Green, Blue, Blue, Yellow. Unlock Rina: Blue, Red, Green, Green, Yellow, Yellow, Yellow, Green. Star Color: Red, Red, Yellow, Red, Blue, Red, Red, Blue. Unlock All Tracks: Blue, Blue, Red, Green, Green, Blue, Blue, Yellow. Vocal FireBall: Red, Green, Green, Yellow, Blue, Green, Yellow, Green. The following characters can be unlocked in the Xbox 360 version of Guitar Hero World Tour. Complete the indicated task to unlock the character, they will then become available for purchase in the character selection screen. Unlock Billy Corgan: Play the song 'Today' in the band career. Unlock Hayley Williams: Play the song 'Misery Business' in the vocals career. Unlock Ozzy Osbourne: Play the Ozzfest gig in the vocals career. Unlock Rockubot: Complete the drum career. Unlock Skeleton: Complete the vocals career. Unlock Sting: Play the song 'Demolition Man' in the bass career. Unlock Ted Nugent: Beat his guitar battle in the guitar career. Unlock Travis Barker: Play the song 'Dammit' in the drum career. Unlock Zakk Wylde: Beat his guitar battle in the guitar career. The following achievements can be unlocked in Guitar Hero World Tour on the Xbox 360 video game console. To unlock an achievement and the gamerscore points (noted in braces) associated with it simply complete the indicated task. Can't Get Enough of Guitar Hero? Be sure to check out Guitar Hero 2 for the Xbox 360 and Guitar Hero 3 for the Xbox 360. What Is the Track List for 'Guitar Hero World Tour'?